A nurse and a fiery freedom fighter for the South African “renaissance”, Albertina Sisulu was the only woman to attend the first ever ANC Youth League conference in 1944 at her husband Walter’s side; later filling leading roles in the ANC and the Federation of South African Women (FEDSAW). She was among those in the front row of the Pretoria Women’s March on 9 August in 1956, with the likes of Helen Joseph, Sophie de Bruyn and Lilian Ngoyi – fellow icons who formed part of the 20 000-strong force who walked to the Union Buildings with a petition to prime minister JG Strijdom, in protest against the Pass Laws and the Urban Areas Act. One of the songs they sang contained the words: “you have tampered with the women, you have struck a rock”. 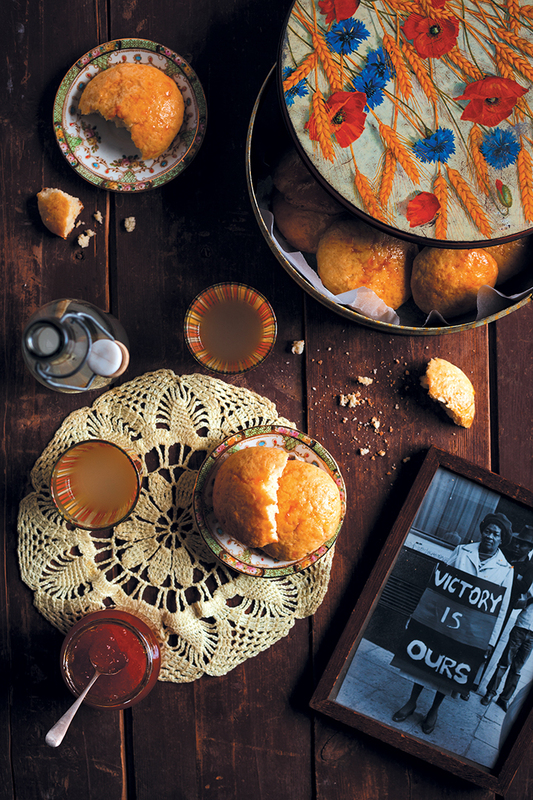 Also known as “township scones”, they’re usually served at celebrations and family gatherings. For the AmaPotchefstrooms, preheat the oven to 190˚C (or to 170˚C for fan-assisted ovens). Sift the cake flour and baking powder together and add the castor sugar. Grate the butter/margarine into the flour mixture and rub it in with your fingertips until the mixture resembles coarse breadcrumbs. Whisk the amasi/buttermilk, eggs and caramel essence together. Add the wet ingredients to the dry ingredients, using a knife and cutting-like motions to combine. Be careful not to overmix – the mixture should be shaggy and just come together. Turn the dough mixture out onto a floured surface and lightly press the dough together. Flatten slightly with your hands, then cut out 7cm-diameter discs with a cookie cutter. Place the scones in a greased and lined baking tray, and bake in the preheated oven, 15 – 20 minutes or until golden. Make the glaze by mixing the apricot jam and hot water together. As soon as the scones come out of the oven, brush them with the glaze. Serve with extra apricot jam alongside and a glass of milk, if desired.